For other uses, see Pokrovsky (disambiguation). Pokrovskoye, along the Tura River in 1912. 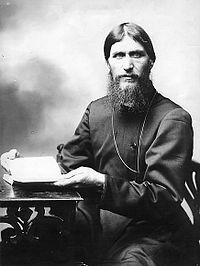 Pokrovskoye's most famous son, Grigori Rasputin. Pokrovskoye (Russian: Покровское) is a village (selo) in Yarkovsky District, Tyumen Oblast, Russia. It is the birthplace of Grigori Rasputin. There is a museum dedicated to Rasputin in the village. Pokrovskoye has a typical southern Siberian humid continental climate (Köppen climate classification: Dfb), bordering on a subarctic climate (Köppen climate classification: Dfc). ^ "Climate: Pokrovskoye". Climate-Data.org. Retrieved March 22, 2018. This Tyumen Oblast location article is a stub. You can help Wikipedia by expanding it. This page was last edited on 26 October 2018, at 02:05 (UTC).